Flood victims already traumatized by rising waters from Hurricane Harvey are being re-evacuated after a shelter in Beaumont, Texas, submerged. 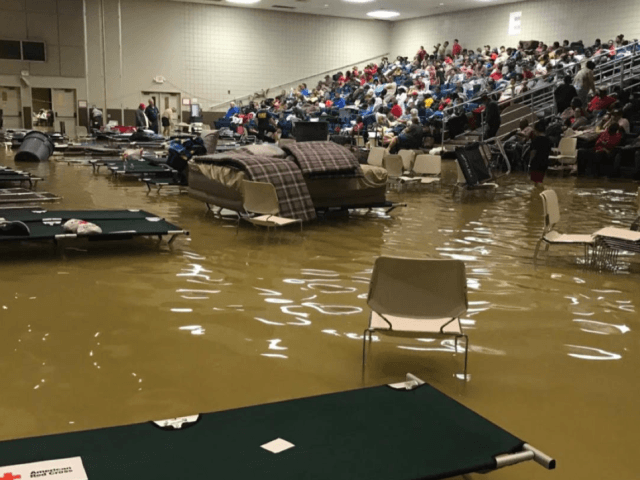 Faced with leaving their homes after flood waters from Tropical Storm Harvey approached the upper Texas coast, people evacuated to the Bob Bower Civic Center in Port Arthur were removed to another shelter. Flood waters rushed early Wednesday morning, 12NewsNow reported. Shelter officials announced they are moving their occupants to the Carl Park Multi-Purpose Center. The water began to seep in around 8 a.m. Within 20 minutes, the floor flooded and people climbed to stadium seats as a result. Inhabitants will be relocated to safety. Rains continue to pound far southeast Texas as Tropical storm Harvey finally made its exit from the Lone Star State. Up to 30 people are suspected dead, mostly from people driving into flooded streets. Police in Beaumont, Texas, reported they rescued a small child in a storm drainage canal as she clung to her mother’s floating, lifeless body, Breitbart Texas reported. The child suffered hypothermia but was otherwise unharmed. Rescue workers attempted to revive the mother but she was already dead. The mother’s car stalled as she drove in a flooded parking lot. When she got out of the vehicle, carrying her daughter, the rapidly moving water swept her away. The National Weather Service’s 4 a.m. update reports Harvey make its second U.S. landfall near Cameron, Louisiana, in the pre-dawn hours of Wednesday.The storm continued moving to the NNE (30 degrees) at 7 mph with maximum sustained winds of 45 mph. The storm is expected to weaken as the center moves back on shore and will begin to move more rapidly to the northeast through the lower Mississippi Valley, eventually reaching the Tennessee Valley on Thursday. Heavy rains and flooding continue to be the major threat as the storm moves northeastward.